Spring is officially here. The plants are in full bloom, spring breakers are flooding the area, and the Easter holiday is just around the corner. I must say I do love the smell of Orange Blossoms in full bloom, which scents the air of citrus when I walk out my door. It is most definitely the best perk of living outside the city and near the orange groves. The thing I hate most about spring happens to be the spring breaker tourists, which remind me of the long few months ahead of tourists. I shouldn’t much complain about tourists I suppose, as they do keep me busy in business equaling more hours and a larger paycheck. However I can’t get myself to like the onslaught of invaders crowding the Florida roadways with maps on the steering wheel driving twenty miles under the speed limit looking for the nearest Disney World signs and causing me to leave for work and school hours in advance just to get anywhere on time. Perhaps the best part of spring is Easter as I love all holidays. I love the food, I love the cute Easter bunny toys and bags and chocolates. It is with the Easter bunny in mind that this cupcake has come about. What better way to lure the Easter bunny to your home then with his favorite food inside it… the carrot. 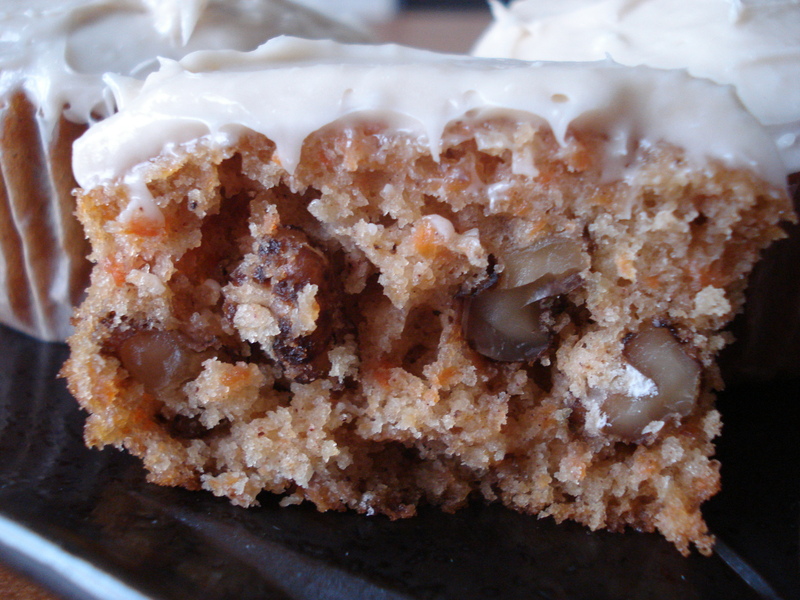 Carrot Cake is traditionally…well a cake cut into squares and covered in a thick layer of cream cheese frosting. But in order to make it more accessible for mom or dad err I mean the Easter Bunny to eat on the go after hiding countless Easter eggs and baskets around the house, I present to you the Carrot Cupcake. These little Easter delights are a mouthful of moist and richly spiced cake with a fluffy sweet cream cheese frosting. The Easter bunny would never know these cupcake versions of the 1970’s cake fad were once considered health food as they are so deliciously satisfying as a junk food treat. By adding chopped walnuts and raisins, they are also more interesting and a bit more eclectic when put against the traditional cake. 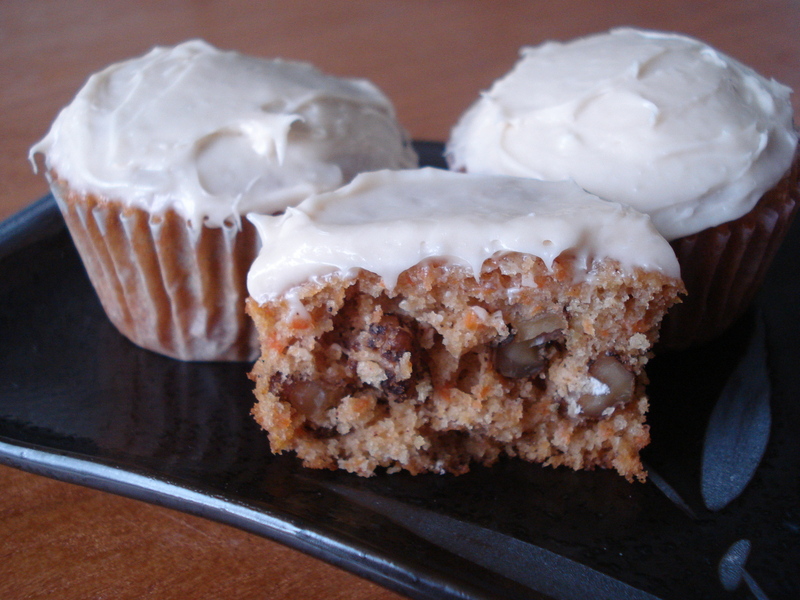 Even though the Carrot Cupcakes are reminiscent of a bake sale offering for children they are most definitely a grown up treat. So to all the Easter Bunnies out there this year…enjoy a treat designed just for you!!! Adjust the oven rack to the middle position and heat oven to 350°. Line a standard sized muffin tin with cupcake liners. Cream the butter and sugars together in a large bowl. Slowly whisk in the eggs. Add the remaining ingredients and mix until thoroughly combined. Divide the batter evenly among the cupcake liners. Bake for approximately 18-20 minutes. Cool the cupcakes in the muffin tin for 5 minutes then remove and cool completely on a wire cooling rack. 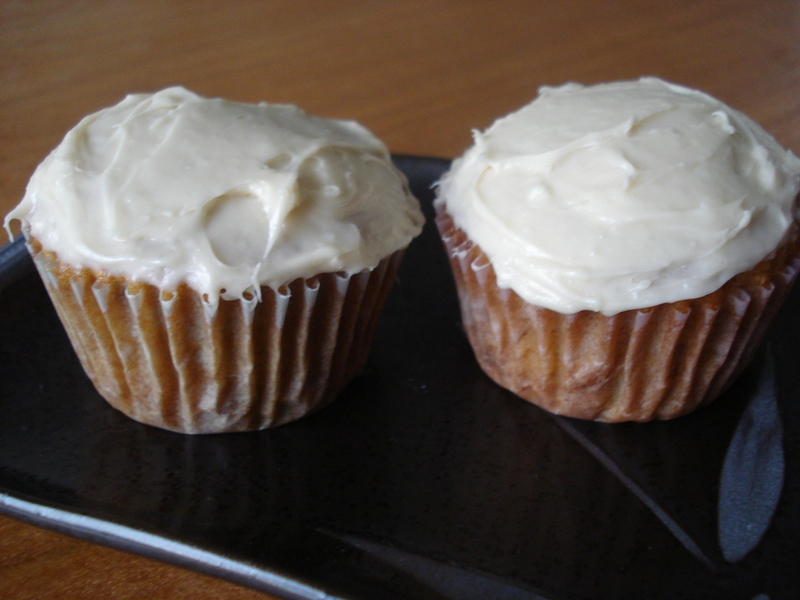 Once cool frost cakes with a thick and even layer of cream cheese frosting (formula follows). In the bowl of an electric mixer set on medium-high speed, cream the butter and confectioner’s sugar together until it appears light and fluffy. Add the cream cheese one piece at a time, beating thoroughly after each addition (you should have about four pieces). Add the vanilla and mix gently until no lumps remain. 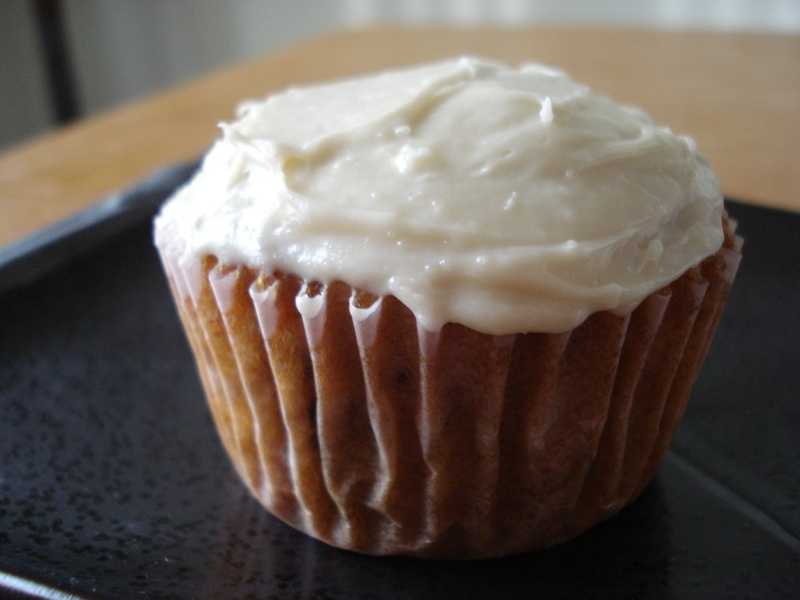 Using an offset spatula, gently spread a thick layer of frosting over the cooled cupcakes.